This sweatshirt is 100% made from fabric which is made in the usa and is 100% manufacturered in the USA. The Legacy hood is a comfortable classic zip up hoody. Soft 80% cotton/20% polyester heaavyweight 9 oz. 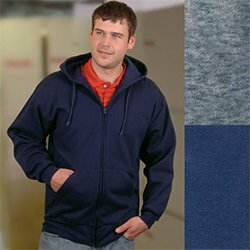 fleece full zip hooded jacket with kangaroo pocket. 100% Union Made in the USA.